Removals From Spain To England - What Factors Will Affect The Cost Of Your Move? Hiring a professional firm to help with your removal from Spain to England is not the cheapest option: but there are many benefits to trusting in the professionals to make your move as seamless and simple as possible. It would be impossible to quote an exact figure for removals from Spain to UK without getting information from the client on their requirements: in fact, you should be wary of any firm that will give you a fixed price cost without discussing your move in detail. The cost of your move may be influenced by a number of factors, most importantly the volume and weight of your possessions. The more that needs to be moved, the larger the van and therefore higher the price � volume will also affect how many men the firm need to hire for the job. If you need to have your move all taking place on one day, the firm would need to hire more crew members, increasing the cost again. You will face a similar issue during school holidays or at the weekend, where periods of high demand will push prices up. Asking the firm to do your packing, and transporting high-value or fragile items both may push the cost up. We�re constantly striving to offer the best price for a secure, safe and well-costed move. 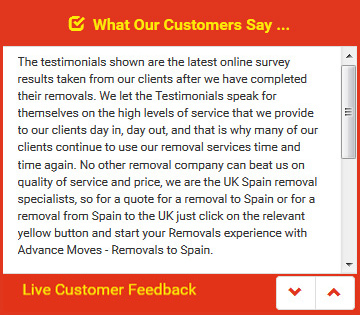 Get yourself an expert quote for removals from Spain to England from a company whose reputation is second to none: fill in our enquiry form or contact the team on 0871 218 0612 to find out more.